creates and reminds me alot of open weave (basket weave) crochet. To begin, cast on in method you prefer. I would do at least one normal row of ewraps. 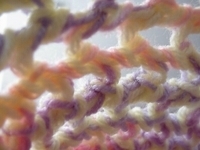 This shawl is made using a modified Flat Knit Wrap Method. Peg one: Wrap from back (around) to front and knit off. Next Wrap all 3 first pegs. You’ll be working in multiples of 3 from now on. 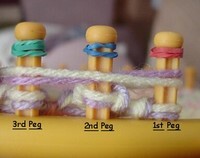 To recap: You wrapped 1 peg, Knit off, Wrap 2 Pegs, Knit off, Wrap 3 Pegs Knit off. This is the beginning of your pattern. You will continue to wrap like before, except now you will come around the 2nd peg and wrap to the 4th peg. Knit off. When you get to the last 3 pegs on your row wrap: Last 3 Pegs, Knit off, Last 2 Pegs Knit off, Last 1 Peg Knit off, and then begin again. 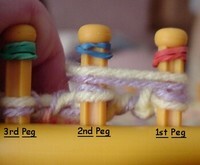 As you can see, when you wrap backwards, it creates a Z shape with some of the yarn behind the peg. 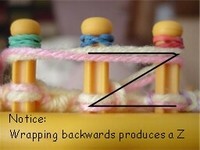 This is where the name comes from and you should see the Z bar when ever you are doing the pattern. If you don’t, you didn’t wrap backwards. Edges create a slightly scalloped edge with points. Open loops easy to add a fancy boarder or leave as is. One Final close up picture. As you can see the bars are joined in between stitches and create a unique basket weave look. Awesome looking pics Tina. Very colourful. I love your new stitch Tina! I can’t wait to try it out myself. Question – do the sides curl like they do with stockinette? 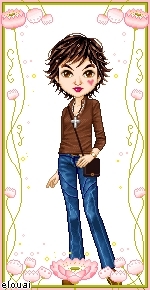 Your’s doesn’t look like it curls, and it doesn’t look like you purled the edges. Oh, you are so very creative! very pretty. You have made some very nice things. Does the Sides curl: Nope they don’t! The bottom might unless you do a cast on that prevents that or a row of purl stitches, but the sides actually create a slighly picoted look especially if you pull the stitches tighter at the end. 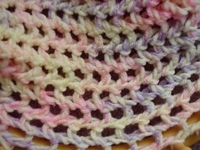 Love the Dove Stitch! How did you do that?? What a lovely stitch! Must try it ASAP. Looks it doesn’t stretch very much? Keep on that lovely creative work! I do a lot of hats for the preemies and newborn. Sure going to try the new stitch. What a beautiful baby. She is gorgeous. Your a joy to have around. What can you use this stitch for . Hi, How does this work when knitting in the round? 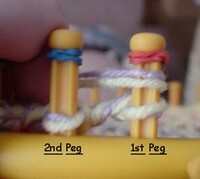 is it better to use a loom with even or odd # of pegs? does it matter? What is the dove stitch ? Have you done a video for it? Please tell me how many pegs you used for the baby blanket. Help the Center for Pregnancy Choices get a website! Please Vote!